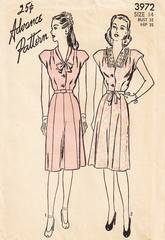 Vintage Advance 3972 Misses' dress pattern from the early 1940's. Dress with V front neckline framed with a narrow collar and bow or a tailored lingerie collar. Extended shoulders created very brief cap sleeves. Paneled skirt. Front button bodice and side placket for zipper or snap closing. Pattern uncut, complete and in original folds. Unprinted, perforated pattern pieces.